The impact, Exadata will have on your IT’ s organizational structure can range from ‘None at all’ to ‘Significantly’. I’ll try to explain which kind of impact will likely be seen under which circumstances. The topic seems to be very important, as it is discussed often in my courses and also internally. First, it is probably useful to be clear about the often used term ‘Appliance’ in relation to Exadata: I think that term is misleading in so far as Exadata requires ongoing Maintenance & Administration, similar to an ordinary Real Application Cluster. It is not like you deploy it once and then it takes care of itself. 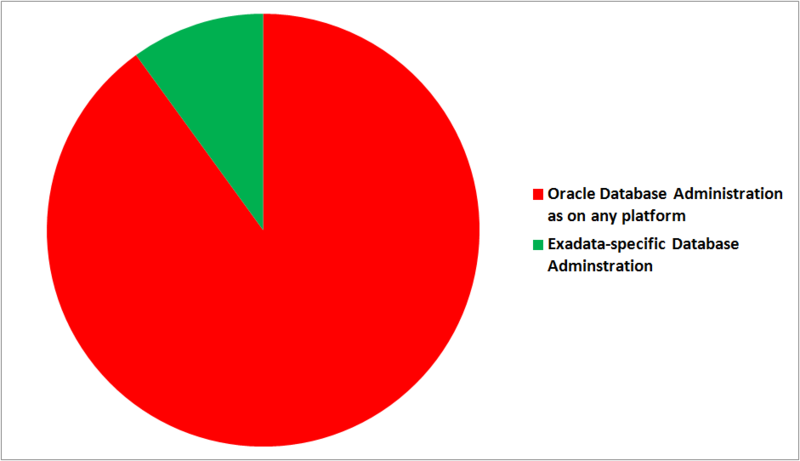 Without pretending precision (therefore no percentages mentioned), you can see that the major task on Exadata is by far Database Administration, while Storage Administration and System/Network-Administration are the smaller portions. The question is now how this maintenance is done. You could of course decide to let Oracle do it partly or completely – very comfortable, but not the focus of this article. Instead, let’s assume your IT Organization is supposed to manage Exadata. The responsiveness and agility towards business requirements will be the same with the siloed approach as it is presently with other Oracle-related deployments at your site. There is obviously some internal overhead involved, because the different teams need to be coordinated for the Exadata maintenance tasks. This approach is likely to be seen if Exadata is deployed more for tactical reasons (we put this one critical and customer-facing OLTP system on an Exadata eight-rack, e.g.) respectively if your internal organization is very static and difficult to change. I have seen this from time to time (SysAdmins in the course who have never seen Oracle Databases before), but I would say it is more an exception than the rule. In short: You will get the technical benefits out of Exadata, but you will leave benefits that come from increased administrative efficiency and agility on the table. 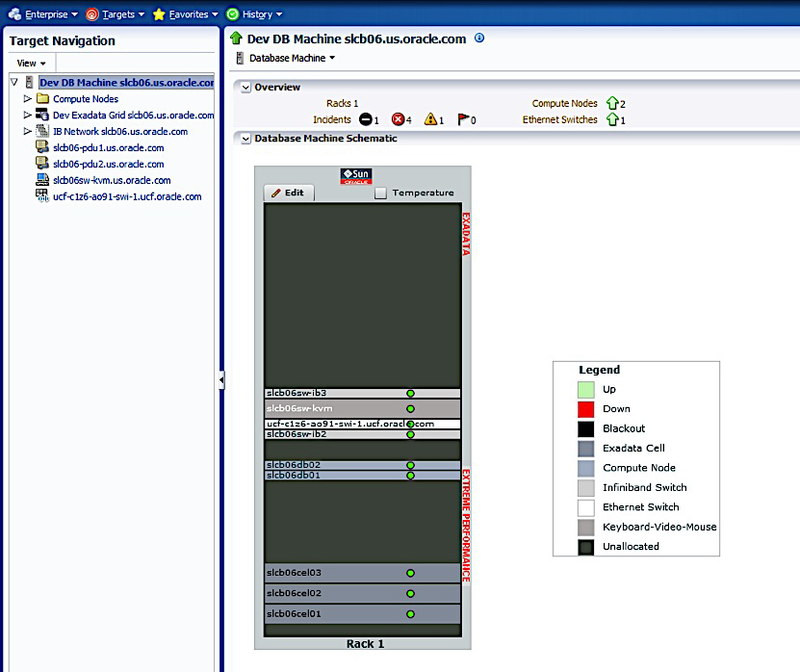 For DBAs, it is similar as moving from a Single-Instance system to RAC. Some additional things to learn, like Smart Scan and Storage Indexes. 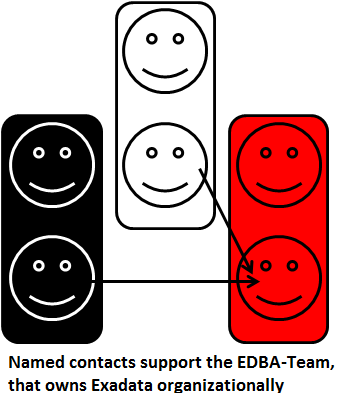 Over time, the DBAs on that team may incorporate the know-how they gather at first from their named contacts of the other groups. 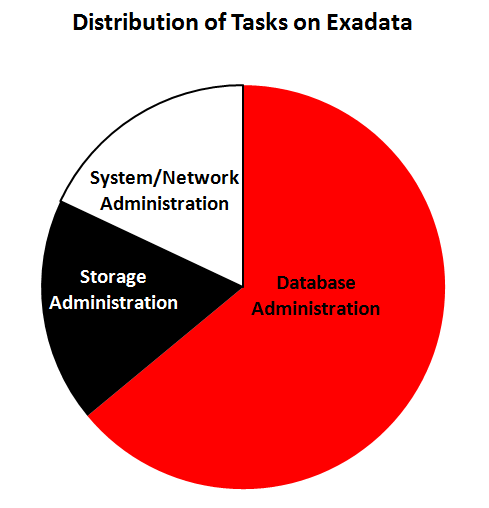 The pragmatic EDBA approach is likely if Exadata is seen as a strategic platform, but the effort to build a DBMA team is regarded to high respectively the internal organizational structure is not flexible enough to start with the third approach. 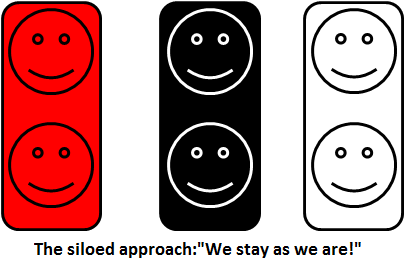 Administrative responsiveness and agility are already higher here as with the first approach, though. This gives you the optimal administrative responsiveness and agility for your business requirements related to Exadata, which is what the majority of customers will probably want to achieve – at least in the long term. You will see this approach most likely if Exadata is supposed to be a strategic platform at your site. The good news (in my opinion) for the team members here is that they all will enlarge their mental horizon and gather new and exciting skills! Much of the above, especially the terms EDBA and DBMA can be found in our Whitepaper Operational Impact of Deploying an Oracle Engineered System (Exadata) – for some reason it is presently only available through our Oracle Partner Network. It’s kind of our official ‘party line’ about the topic, though. I’d also like to recommend Arup Nanda’s posting Who Manages the Exadata Machine? that contains related information as well. This entry was posted on February 20, 2013, 15:21 and is filed under TOI. You can follow any responses to this entry through RSS 2.0. You can leave a response, or trackback from your own site. 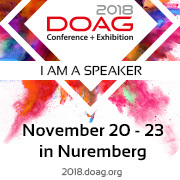 Uwe, Great post, but I think it needs more detailed information for real life of a DBA who is managing Exadata on consolidated environment which consist of different product groups as EDBA. 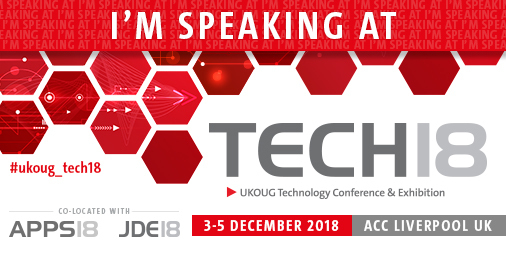 Our exadata DBAs (3 of them in follow the sun model) are currently having many(really many) meetings (conference calls) just to convince business groups to upgrade to a certain version/BP patch, flash cache upgrades, battery replacements, disk replacements and on site engineer visits etc. Once you convince them, it is just a beginning, it continues to start with scheduling and planning, raising changes chasing people for approval spending endless hours on mail threads and telephone. This ends up spending too much time on political activities rather than technical. Worst is that if your business groups are early adapters where so called “online” changes caused interruption, there is no way you can convince them to have weekday changes so everything needs to be scheduled for the weekends. In my humble opinion Exadata especially EDBA approach is really a pain as single team needs to manage/plan/implement everything in whole stack. thank you for sharing your experience here, I really appreciate it! What you say makes of course sense and is not so surprising – I think it was kind of predicted in the article even. 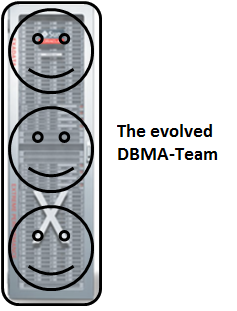 It’s often for ‘political’ reasons that the DBMA team is not the first choice, although it offers the most administrative efficiency for a strategic Exadata deployment. I have a question on one of your old post – Tablespace Point in time recovery. I am trying to test TSPITR recovery as per the steps given by you. I checked on Oracle support and re-run the catdph.sql,prvtdtde.plb, catdpb.sql, dbmspump.sql, utlrp.sql and bounced the DB but this issue still persists. Kindly let me know if I am missing some thing here.